I laugh hysterically anytime I come across this tariff. With Glo overload, you are overloaded with airtime and data at the same time. But instead of being arrested for this overload, you are rewarded with a very cheap call rate and abundant data bonus on tariff plan. This is what I’m saying, if you recharge with anything upward from ₦200 and you are on Glo overload tariff plan, you will have as bonus 400% of airtime you recharged. Apart from this, you will be allocated 15 MB data. But it does not end there at all, after every 3 minutes of call, you get extra 1 minute for sure. As good as it sounds, however, you are charged ₦36 for the first minute of call each day. Ah!! Expensive you say. Yet, you discovered that there’s plenty to enjoy by the time you use try it out. 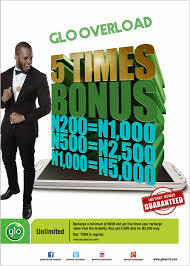 Take note too that the data bonus allocated to Glo overload is valid for that day only. If not used up within the validity day, the rest will expire. Still you get to carry a lot of load of data on you line to browse anyhow. More interestingly, you can monitor your Glo overload airtime and data usage by checking your balance with *122*7#. 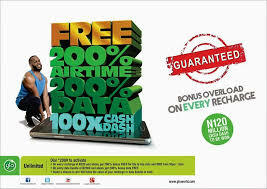 If you love to migrate to Glo Overload, just dial *200#. You will surely get too much airtime and data than you can carry.